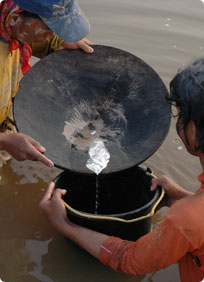 The Global Mercury Project (GMP) is an international initiative designed to limit mercury contamination from artisanal and small-scale gold mining activities, by demonstrating ways of overcoming barriers to the adoption of best practices and pollution prevention measures (http://www.globalmercuryproject.org/). Randy Baker of Azimuth co-authored a comprehensive guidance manual entitled “Protocols for Environmental and Health Assessment of Mercury Released by Artisanal and Small-Scale Gold Miners”, prepared with Dr. M. Veiga of the University of BC. Subsequent to this, he also co-authored a “Manual for Training Artisanal and Small-Scale Gold Miners” on behalf of UNIDO. These two documents were developed to present important information for those planning to establish environmental and health assessments in areas impacted by mercury released by artisanal and small-scale mining — within the context of developing nations, where such activities are more common. The detailed Protocol covers sampling issues, bioavailability, methods to investigate the locations of mining and environmental “hotspots”, mercury analysis, and human health assessment. The Training Manual provides simplified information about critical issues in a frequently asked questions format that was based on an extensive literature review and considerable experience with implementing these protocols in many countries around the world.